Pot magnets (neodymium magnets) with threaded stud. These pot magnets have a stem with an external screw thread. You can slide the stem, for instance, through a hole and fasten it with a nut Pot Magnet with External Threaded Stud have an improved magnetic circuit, which allows clamping forces to achieved through minimal size. 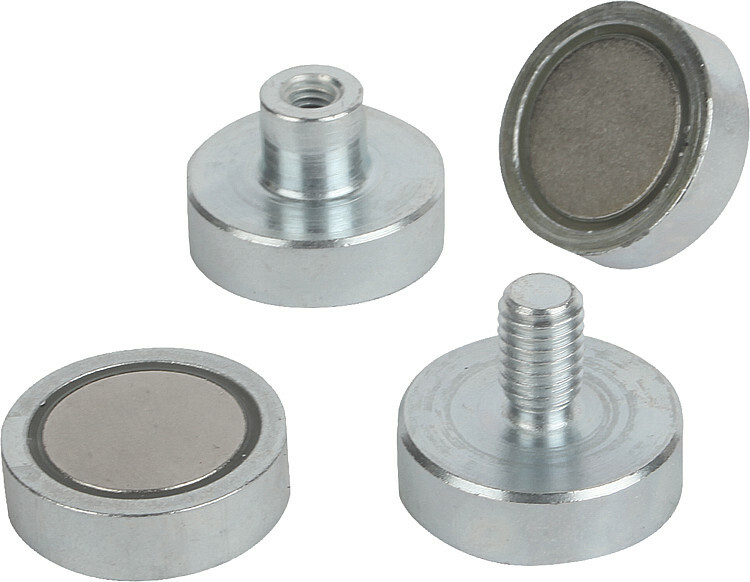 Customized Neodymium Pot Magnets with External Thread Stud can be made upon request. Magnosphere Magnets offers pot magnets that produces increased amount of force into a material known as ferromagnetic. Coated with Ni or Zinc plated steel, NdFeB Pot Magnet with External Threaded Stud have an improved magnetic circuit, which allows clamping forces to achieve minimal size. To clamp up the magnet in such a place there are some pot magnets comes in standard hole and a nut. Within the pot assembly of these magnets, it carries out NdFeB permanent magnets. To make it workable at sub zero conditions (-10 to -20 deg C), ferromagnetic casing and design the whole process of Demagnetization which provides NdFeB can use up to +80 deg C.
Some versions have an additional rubber coating also. Although, this rubber coating introduces an “air gap” which reduces the maximum clamping force. The additional friction provided the magnets to be clamp on a vertical surface, with extra friction to minimize sliding. 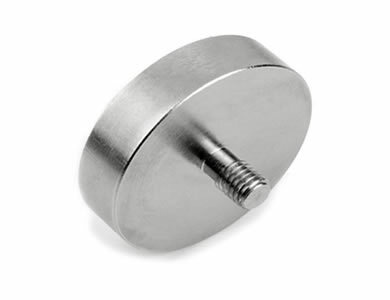 The sheer force required to slide a pot magnet along a clamped surface is approximately 1/5th of that of the direct pull force required to pull the magnet perpendicular to the clamped surface; using a rubber coat magnet which improves the sheer force. 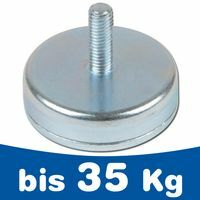 The Pot Magnet that produces an with Male Threaded / External Threaded Stud / Boss, Mounted on a dimension in such way, that the basic pot size and the size of the stud which are given to the total height. The height of the main pot magnet plus the length of the stud. Who supplies high quality External Thread Neodymium Pot Magnets? Magnosphere offers best priced External Thread Neodymium Pot Magnets globally to all industries, including Automotive, Aerospace, Military, Advertising, Design House, Electronic and Academic/R&D. Please inquire for custom Neodymium magnets or magnetic assembly. Buy External Thread Neodymium Pot Magnets at Magnosphere and get a better deal!